When using Profit Rhino's mobile tool, you may run into some jobs where you'll need to buy the required part for the customer. Now, because the pricing of the repair you're doing is decided beforehand, you'll need to know how much to spend on said part. 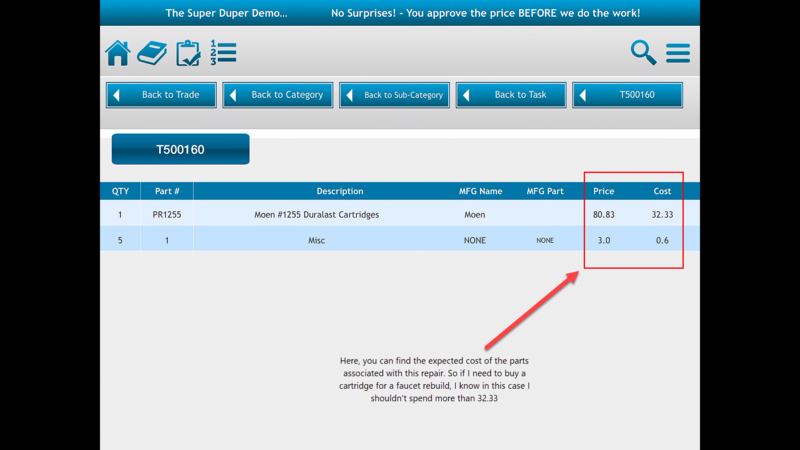 After you've selected that button, you'll be brought to another screen where you can view the parts needed for that repair, their costs, and their expected retail price. Now, if you need to buy a cartridge for a faucet repair, you can see about how much you're expected to spend and plan accordingly. Good luck!